We had dinner at Bulent’s aunt’s home the other night. It is always a treat because she is a great cook. It is also really fun because I get to practice my Turkish with her. She is really patient and so excited by my progression in Turkish that she heaps on tons of compliments (positive reinforcement) and I always feel really confident speaking with here which actually raises my language level. This is one of my favorite foods. Eggplant salad. She roasts the eggplant ( it has that yummy charred taste), and then mashes it. After she adds yogurt and garlic that she has pulverized with a mortar and pestle (it has a different taste from a garlic press when you process it that way, I have no idea why.) It is creamy and tangy and just amazing. 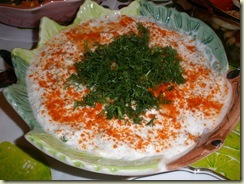 You can’t see this well because of the decoration of eggs and tomatoes but this is piyaz, a cold white bean salad, made with onions, parsley and apple vinegar. 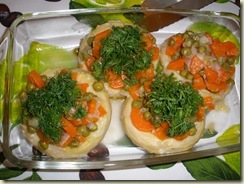 These are whole stuffed artichoke hearts, stuffed with peas and carrots and potatoes, topped with dill. They are considered an “olive oil” dish and served cold. 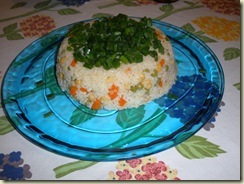 Below is a vegetable rice pilaf molded and served with green onions on top. This is how they serve steak in Turkey. Meat is never eaten rare in Turkey. This is called bonfile or tenderloin. 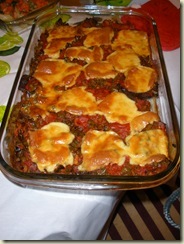 was cooked casserole style with tomato sauce and mushrooms topped with cheese. She really went all out with the food that night. This is great because I am still learning how to cook Turkish foods, and seeing and eating it give me a better idea of how and what to prepare. 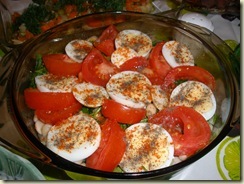 This entry was posted in Cooking, Family, Turkey and tagged Expat, Turkey, Turkish by Jules. Bookmark the permalink. You mentioned being able to speak Turkish. I'm jealous. I've been here a year longer than you–I'm also married to a Turk that studied in the U.S. (and Canada). I don't speak Turkish more than a few minutes a month. I've taken 400 hours of lessons (Dilmer, Kadikoy Culture Center, Berlitz, private), but still can't order at a restaurant. I'm planning to resume lessons soon. Where are you studying, and for how many hours a week, etc. ?